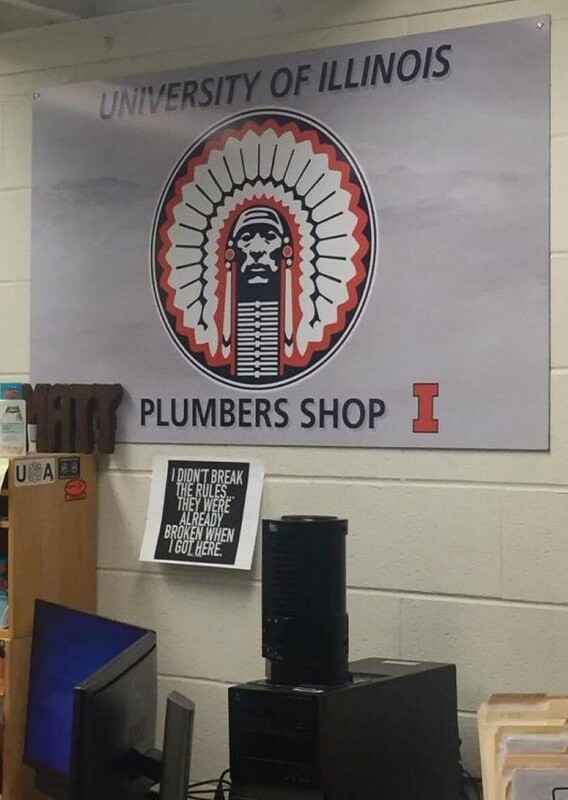 The Plumbers Shop in the University of Illinois Facilities & Services building, 1501 S. Oak St. in Champaign. The Illinois Student Government passed a resolution on Wednesday to remove Chief Illiniwek symbols from all University buildings. A conversation about the University’s controversial former mascot, Chief Illiniwek, will take place on April 10 from 3-5 p.m. at the Student Dining and Residential Programs Building in the Ikenberry Commons. The event, featuring two keynote speakers, is meant to be an open-ended discussion on how the University can move past the controversy surrounding the mascot. One of the speakers, Dan Maloney, is a University alumnus who performed as Chief Illiniwek during the Illini men’s basketball game in 2007, the last game to ever feature the mascot. The other speaker is Kevin Gover, a Native American attorney who previously served as the assistant secretary for Indian Affairs under former President Bill Clinton from 1997 to 2000 and is currently the director of the Smithsonian National Museum of the American Indian. The event is free, but seating is limited to 180 people.